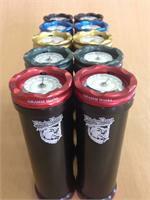 This is our single Cigar holder, 7.75x70 capacity. Anodized Aircraft Grade Aluminum. Caps fitted with foam bumpers to protect your stick.